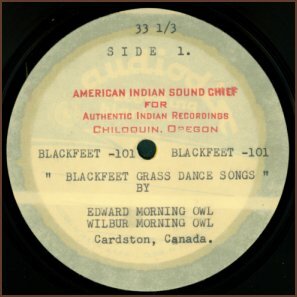 "American Indian Sound Chief" recordings. This record, like other records on these pages, is very old and very rare. This record is another in field live recording on an "Audiodisc Recording Blank" and does display a drive pin hole offset from the center spindle hole, as with other records found here. Based on recording speed, 33 1/3 rpm, recording is circa 1950 - 1960. There are ten songs in total and you will note there are no titles for songs. 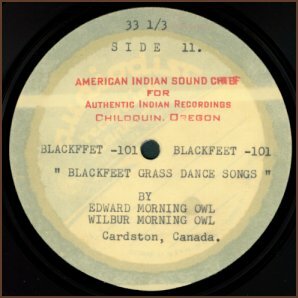 These are all Blackfoot tribe Grass Dance songs.